RFE: Are you in favour of land swap between Serbia and Kosovo in order to move both countries towards the EU? Hahn: I am very much in favour of resolution for any bilateral conflict, but any solution has to contribute to the wider stability of the region, so it can not be that a bilateral solution is on costs of others in the region. Now here we have to see the broader picture, meaning that, whatever the solution is, it must be a solution which is not harmful to others. RFE: But you are not ruling out that? Hahn: I think, let them discuss, they know now very clearly what are out framing conditions and I think to achieve something, you have to think out of the boxes. RFE: So what is your framing condition? 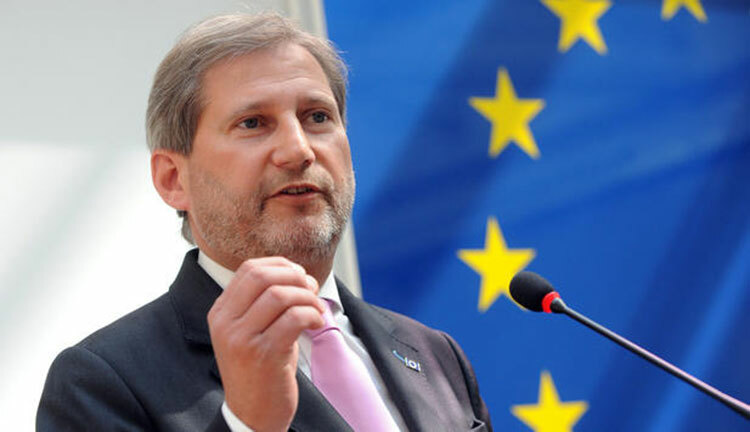 Hahn: To have more stability in the region and that each individual solution, each settlement of bilateral conflict, has to contribute to overall stability and development of the region, because at the end of the day, the aim is that all the six countries should become members of the EU. RFE: Aren’t you afraid that this might have a negative effect on Bosnia and Herzegovina, Macedonia, even on the countries in the Eastern partnership? Hahn: Look, I think everything is too premature. They are still negotiating. Some ideas have popped up, let’s put it that way, and now it is about them to further negotiate in order to finalise these ideas. I think a package, legally-binding agreement between Serbia and Kosovo has to include a lot of elements and at the end of the day, let’s see what are the final ideas. But I think both parties are now fully aware about the international, I would not say concerns, but to say, limitations, and within that, I think, many solutions are possible. RFE: And you think, finally, that this will be at the end of the Commission mandate you will have a deal (by the end of October)? Hahn: It is not because it is the end of the Commission mandate but it is useful if they can conclude this, let’s say, till summer next year in order to go towards the next steps.